"Space Shuttle Atlantis" at NASA's Kennedy Space Center Visitor Complex in Florida is designed to give guests a nearly 360-degree view of the retired orbiter. Seeing Atlantis on public display is both exhilarating and sad. 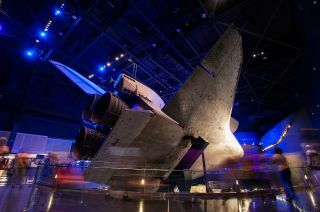 The retired space shuttle orbiter officially went on view Saturday (June 29) at the Kennedy Space Center Visitor Complex as part of a new $100 million exhibition. The mighty spaceship, which traveled to space and back 33 times over 26 years, is an awe-inspiring sight, especially when you're standing just feet away. The new exhibition displays space shuttle Atlantis as if she were in flight soaring over Earth, tilted at an angle with cargo bay doors open and robotic arm extended. The effect made me feel almost as if I was in space too. The sight of Atlantis permanently installed in her new home was bittersweet, though, because the reality truly sunk in that her flying days are over. Some say the shuttles still had life left in them, and could have flown for many more years. Whether or not retiring them was the right thing to do, it's definitely a completely done deal now. Coming face to face with this incredible machine, I was struck by Atlantis' sheer size, grace and complexity. The sight made me proud of what our country accomplished, appreciative of all the astronauts and workers that made the shuttle program possible, and sad that, like all good things, it came to an end.